Hi. I am Ryan, and I founded Reliance with my wife Tracie in 2014. 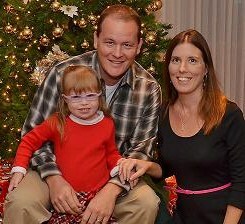 Both of us, as well as our beautiful daughter, were born and raised right here in Volusia County. We went to school here, worked here, and now our daughter is in school here. We love this area and are committed to helping the people here by doing quality work that people can rely on, and using trusted local subcontractors and suppliers. I have been a licensed general contractor since 2009 and have been managing large construction projects since 2003. I grew up around construction, working with my father since I was old enough to use a broom. My father and I built the home that they currently reside in and have lived in since 1990. I have worked in many construction trades professionally since 1991 including plumbing, electrical, stucco, plastering, drywall, framing, carpentry, and roofing. Tracie has a M.B.A. from The University of Florida and handles all of the behind the scenes action. Construction is not all about building things for me, it's about the people that we interact with and helping them to exceed expectations for their projects. That's where our motto comes from. Integrity drives the core of my being and I strive to provide the highest quality in everything that I do. Reliability just comes as second nature to someone who will settle for nothing but the best in all that they do. Why do we choose to do this you ask? I told my wife "people need to have someone that they know and trust to fix things for them. They need to know that they can call one person to get it done and feel confident in the fact that it will be done right", and so was born Reliance.